Morecambe manager Jim Bentley admits tomorrow’s match at Yeovil Town is one they dare not lose. The Shrimps head to Huish Park for a match that pits League Two’s 20th and 21st-placed sides against each other. 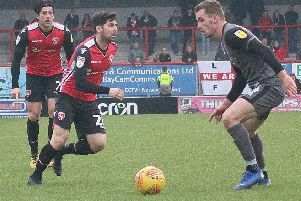 Bentley’s players are the higher of the two teams but last Saturday’s 2-0 loss to Lincoln City means they are only five points ahead of second-bottom Macclesfield Town with a dozen games of the season remaining. They go into the match, looking for a third straight away win following their successes at Port Vale and Oldham Athletic. For their part, Yeovil ended a run of six consecutive losses with last Saturday’s win against Cambridge United which saw them close to within two points of Bentley’s players. “Lincoln came here and turned us over but it wasn’t that hard to beat us,” Bentley said. That victory came at the start of November when goals from A-Jay Leitch-Smith and Rhys Oates gave the Shrimps victory at the Globe Arena. Saturday’s game is the latest away day when the Shrimps meet a side similarly battling for points at the bottom of League Two. 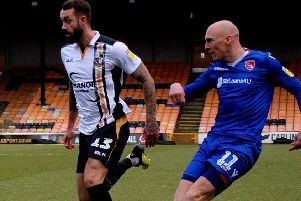 Port Vale are third-bottom of the table, one place behind Yeovil, with trips to Macclesfield and bottom side Notts County still to come in the next five weeks. Bentley said: “It’s come to the stage where it’s ‘must not lose’ games but it’s a big game. “However, that’s what we’re in the game for – the pressure and the challenges that come your way.